In September 2016, the FDA awarded funding to the Medical Device Innovation Consortium (MDIC) to establish the National Evaluation System for health Technology Coordinating Center (NESTcc). Now, just over two years after this initial funding, NESTcc is developing its operational capacity and collaborating with stakeholders in the medical device ecosystem to catalyze the timely, reliable, and cost-effective development of real-world evidence (RWE) to enhance regulatory and clinical decision-making. With the goal of creating a fully operational and sustainable NESTcc by 2021 — and launching NESTcc 1.0 by the end of 2019 — significant progress has been made over the last two years. 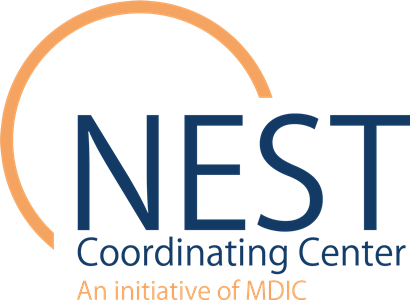 NESTcc was envisioned as a cooperative network of partners working to use data, advanced methodologies, and good governance to improve the state of medical device evidence generation (see Duke-Margolis Center for Health Policy Report 2016). The Coordinating Center’s work has involved developing a robust multi-stakeholder structure — which includes a multi-stakeholder Governing Committee, establishing partnerships with initial network collaborators to form the NESTcc Data Network with access to real-world data (RWD) — and bringing together technical experts on the Data Quality and Methods Subcommittees to develop frameworks for implementation. Through this structure, NESTcc is launching activities to accelerate the development and translation of new and safe health technologies, leveraging RWE and innovative research. The NESTcc Data Network — which currently consists of 12 network collaborators representing more than 195 hospitals and 3,942 outpatient clinics (Fig 1) — will respond to research questions from ecosystem stakeholders, including medical device manufacturers, and generate crucial RWE. For the medical device industry, this RWE may play a significant role in supporting regulatory and coverage decisions. In late 2017, NESTcc began soliciting test-cases from stakeholders in the medical device ecosystem, both to assess the Data Network’s functionality and to answer important questions using RWE generated through the network collaborators. These test-cases will help identify areas where NESTcc could play a role in reducing transaction costs (e.g., contracting, IRB, data sharing agreements, and publication policies). In November 2018, the first round of test-cases was announced. 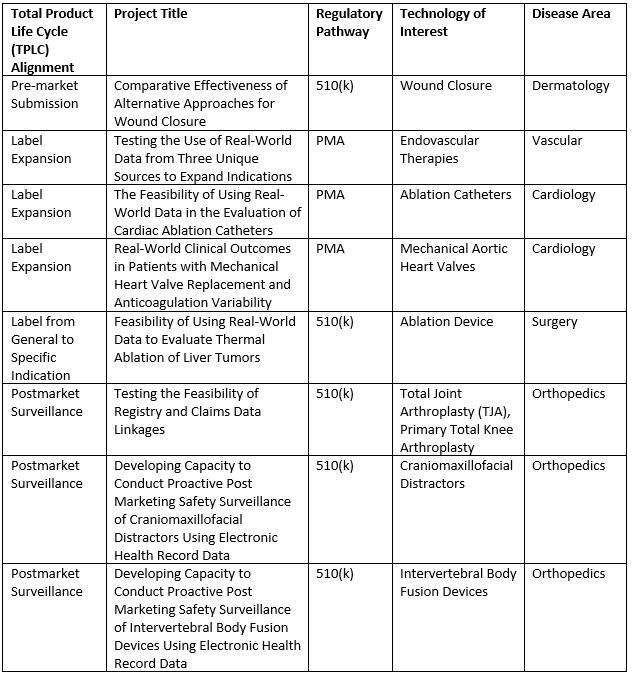 These cases include projects along the 510(k) and premarket approval regulatory pathways, covering five disease areas and spanning the medical device Total Product Life Cycle (TPLC) (Table 1). These are the first projects using the Data Network to receive funding from NESTcc. Table 1 — The first round of NESTcc’s Test-Cases, announced in November 2018. The slate of approved projects for the second round of NESTcc-funded test-cases will be announced in summer 2019. Data Quality and Methods Frameworks — NESTcc intends to publish an initial Data Quality Framework and a Methods Framework to establish the foundation for high-quality data and robust methods, as well as design a process by which NESTcc network collaborators can demonstrate aptitude with these areas. The frameworks will be available for public comment in summer 2019. Proof of Concept for Engaging the NESTcc Data Network to Generate RWE — During the second half of 2019, the first round of test-cases will achieve preliminary results. Insights from these Round 1 test-cases will be collected to better understand the strengths and challenges of the process, and to refine engagement with NESTcc. A second round of test-cases will also launch in 2019. How NESTcc can Add Value for Industry Stakeholders Engaging the Data Network — As learnings are collected from Round 1 test-cases, NESTcc will work with its network collaborators and industry partners to understand how it can simplify and streamline the process of working with the Data Network to answer critical questions. With that understanding, NESTcc will refine the processes for the first non-NESTcc funded projects to work with the Data Network. Expanding Active Surveillance Capabilities — In support of the FDA’s goal to “ensure that the FDA is consistently first among the world’s regulatory agencies to identify and act upon safety signals related to medical devices,” the agency announced in November 2018 an additional $3 million for NESTcc active surveillance activities. To support this effort, the NESTcc Governing Committee approved the formation of an Active Surveillance Task Force, which will develop a roadmap for NESTcc’s active surveillance activities. The Task Force plans to launch a progress statement on NESTcc active surveillance activities by November 2019.
Business Model and Planning for NESTcc Sustainability — The NESTcc Sustainability Subcommittee is working to ensure NESTcc’s long-term sustainability and has selected a vendor to assist in developing a business model and plan, both of which are expected to be finalized in 2019. Additional sustainability milestones are laid out in the 2019 NESTcc Strategic & Operational Plan. In 2017, the ecosystem discussed NESTcc in hypothetical terms. Today, having a functional, albeit nascent, system that is responsive to research questions from the ecosystem is an important achievement. However, there remains significant work to be done as we continue to define and develop NESTcc and its role in the medical device ecosystem. To this end, we rely on engagement from the medical device industry. NESTcc will depend on industry to submit requests to access the NESTcc Data Network and to engage with NESTcc in other ways, such as providing input on our forthcoming frameworks, or by visiting our Opportunities for Engagement webpage. To contact our team directly, please email NESTcc@mdic.org or connect with us at upcoming speaking engagements. To stay up-to-date on current activity, visit the NESTcc news page or follow us on Twitter. Rachel R. Rath, MPH is the Chief of Staff for the NEST Coordinating Center. She joined MDIC in August 2017 from the Patient-Centered Outcomes Research Institute (PCORI). Since joining PCORI in 2014, she helped build and manage the development of the PCORnet, the National Patient-Centered Clinical Research Network, a transformational effort to engage patients and leverage electronic health data to improve the speed and efficiency of clinical research in the United States. Prior to joining PCORI, she worked in public policy for the National Multiple Sclerosis Society and the COPD Foundation and received her MPH in global health policy from The George Washington University.